The Parks of the Val di Cornia, in the province of Livorno, which stretch along the coastal strip opposite the Island of Elba, tell the thousand-year-old story of a country where the remains of the Etruscan town of Populonia and the evidence of the past activity of mining and metal-working are entwined with the splendid natural environments of Mediterranean sea and scrub. The various archaeological and natural sites of our Parks make this area an interesting alternative to the traditional tourist destinations: a place where nature and archaeology converge to let you discover the charm of the “Toscana Minore”. A Tuscany which is still unknown but from a tourist standpoint is greatly appreciated by those who have already discovered it. Piombino, situated on a headland facing the Tuscan Archipelago, has a wealth of interesting history and protected natural areas, making it one of the loveliest, most fascinating areas of the Costa degli Etruschi to explore. Fascinating reminders of the Etruscans are preserved in the Baratti-Populonia Archaeological Park. Piombino, which was governed for a time by Napoleon's sister, Elisa Bonaparte, was an important centre in medieval and renaissance times, and old traditions survive side by side with today's dynamic, efficient town. All kinds of water sports can be enjoyed here, and the countryside is full of trails for hiking, biking and horse riding. Local dishes made with fish or products from the countryside are full of aroma and flavour. Wide beaches of fine, pale sand run down to a cobalt sea. Dense, shady pinewoods border the beach and are criss-crossed with trails for walking, hiking and horse riding. 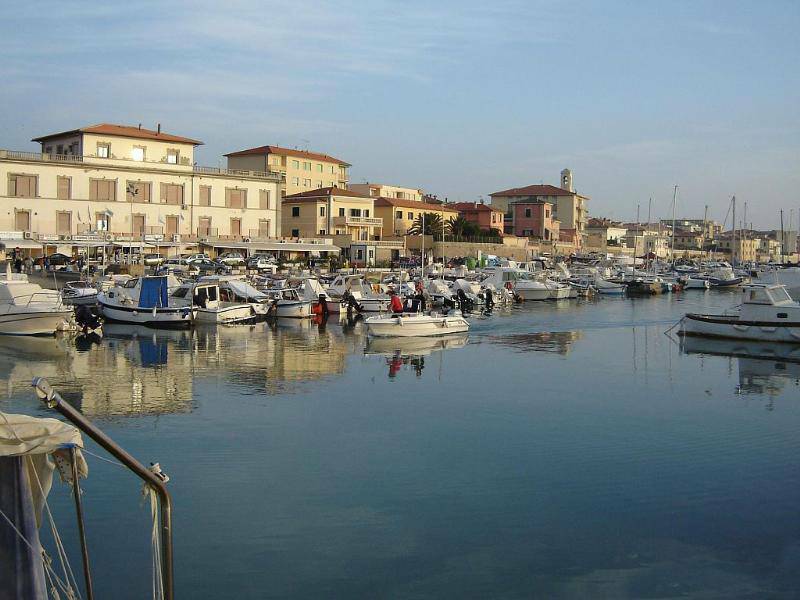 San Vincenzo combines natural beauty with the amenities of a welcoming, hospitable resort, making it an international tourist destination where relaxing holidays can be enjoyed all year round. 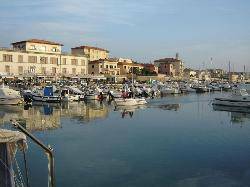 San Vincenzo has been inhabited since very ancient times – later it became an Etruscan and then a Roman settlement. Today, it is a modern, efficient town offering a wide variety of holiday accommodation and sports facilities, in addition to a well-equipped harbour for pleasure craft. It is internationally renowned for is restaurants, which offer dishes based on local products and for the excellent wines from the area. 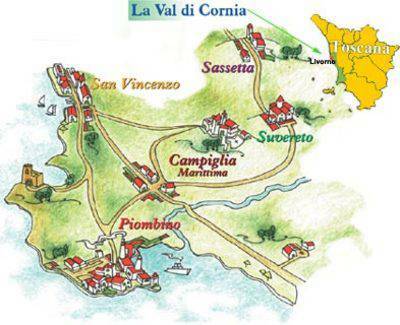 The Rimigliano Nature Reserve with its varied and protected environment, the nearby medieval villages, the Etruscan remains at Baratti and Campiglia and the Venturina spas make ideal San Vincenzo center of gravity for interesting visits and excursions in the Etruscan Coast. Situated on a hill overlooking the sea and the surrounding countryside, Campiglia Marittima is one of the loveliest old hill towns on the Etruscan Coast. Here in heart of the Val di Cornia where ancient traditions live on, remains bearing witness to the Etruscan, Roman and Medieval civilisations can be found. The Val Fucinaia furnaces and the San Silvestro Archaeological-Mineral Park (a splendid open-air museum) tell the fascinating story of how metal was worked from Etruscan times on. The Caldana Hot Springs at Venturina, already known in Etruscan and Roman times, are today a well equipped spa facility for mental and physical well being - The Costa degli Etruschi Wine Route – home of the prestigious Val di Cornia DOC wines - winds through olive groves, vineyards and Mediterranean scrub, where farms and producers of the excellent local extra-virgin olive oil and other delicious specialities can be found. History and folklore come alive during the fests and events held every year to celebrate feast days and the changing seasons. 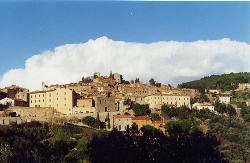 The town is a splendid medieval village whose origins date back to before the year 1000. Situated on the slopes of the hills overlooking the Etruscan Coast, it is a true jewel, rich in history and art, set in the green valley of the River Cornia. Thick cork, chestnut and oak woods, and Mediterranean scrub grow down to the sea. The Wine Route winds its way through countryside rich with grapevines and centuries old olive trees. The region is swarming with agricultural enterprises, oil mills, wineries, and farm-holiday resorts where you can try local products and traditional dishes. The town keeps its antique traditions alive through magical festivals inspired by history and folklore that are held throughout the year, thanks to the mild climate. 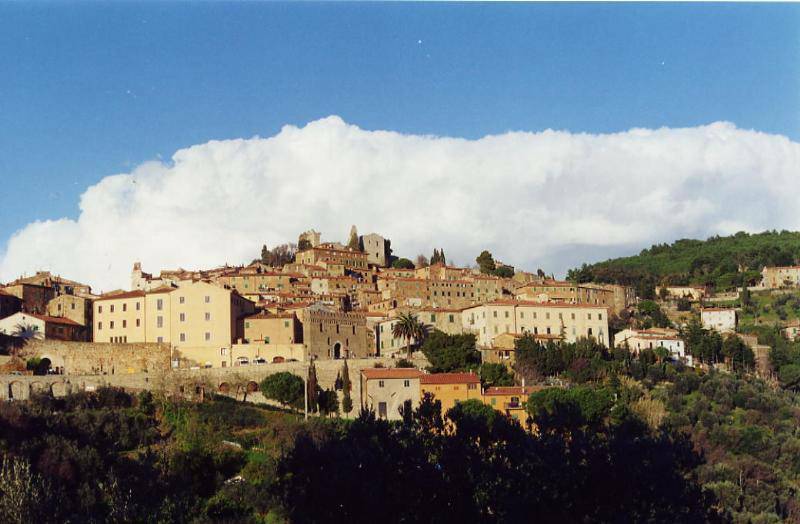 Sassetta is a charming little historical village on the Etruscan Coast, set among woods and stands of chestnuts on a hilltop overlooking the sea. This Medieval stronghold still contains reminders of its past, such as the Romanesque baptismal font, a 15th-century painting of the Virgin, a rock crystal crucifix (15th-16th century) and other paintings which are to be found in the ancient church of St Andrew Apostle. The woods are full of hiking trails and paths for walks, cycling and horseback riding, and numerous agricultural holdings offering holiday accommodation and local produce can be found here too. In Sassetta, old traditions handed down through the years are kept alive with colourful, folkloristic events. Sassetta's delicious, wholesome food is celebrated at the autumn fests.